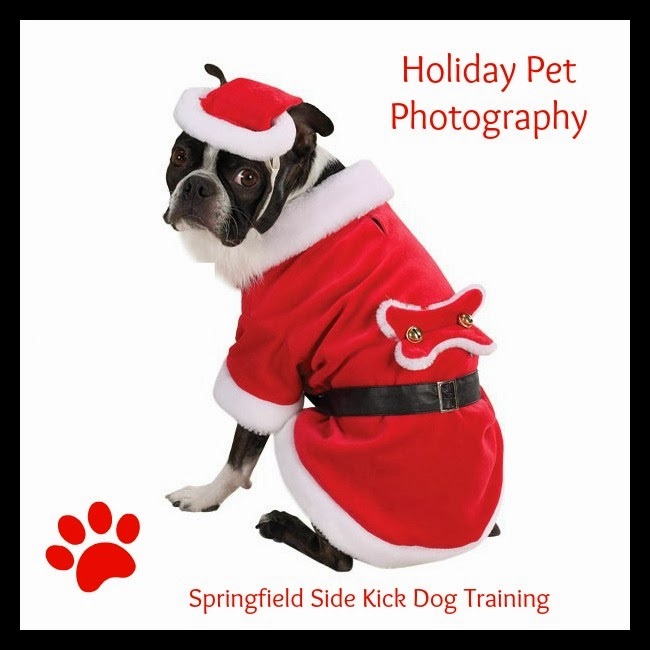 Springfield Side Kick Dog Training Blog: Easy, Breezy, Beautiful. Cover Dog! Easy, Breezy, Beautiful. Cover Dog! Holiday Pictures That Are Magazine-Worthy Are Just A Few Training Sessions Away! Believe or not, your dog can look like a Celebri-Dog with just a few essential behaviors in place! As with any new territory, practice makes perfect and with a few simple steps learned, you can make this a comfortably learned behavior and a stress-free experience for you too! When we teach a dog to stay in obedience class, it can be a serious exercise. Sometimes dogs find "stay" to be stressful especially if they are punished for getting up so we do not recommend anything other than positive reinforcement. This pays dividends later when you hope to "extend the stay" to encourage patience, which, of course, entitles your dog to a reward during the learning phase. During this entire process, we have the dog do something that is somewhat unnatural for them -- stay at a distance away from us and do things among exciting distractions. It takes practice to get a dog to follow cues at a distance away from us especially when we train them to do the behaviors right next to us. Since cameras can be intimidating perhaps because of their reflective lens, which can really look like a giant staring eyeball, dogs tend to look away or avoid the camera. Ultimately, we have them do something that makes them a little stressed and then we point a big shiny eye at them just before we expect them to look cute. This makes it hard to get a cute picture of the dog and even the people involved. In order to overcome a dog's adversity to the camera lens and to achieve overall comfort, we need to train with our end goal in mind. 1. Work "stay" in a happy relaxed way, with distractions or other people near your dog -- like you would pose them for a pic. Make funny noises and then reward them for staying. 2. Help them become acclimated to the camera so they have a happy response to the "giant eye" that stares at them . Hold the camera near them and do fun stuff to get their mind off it it. Back away and act a little serious like you do when you are trying to concentrate on getting a good photo, then give them a treat. 3. Teach them to tilt their head or smile on cue so they can do it right when you need it. Pair this with staying a distance away from you. After all is a "wrap" and their picture is perfect, take solace in the fact that you helped them gain the confidence to take the first steps and pose like a Celebri-Dog on Day 1!